Robot toys are usually made of plastic and require batteries. Not this one! 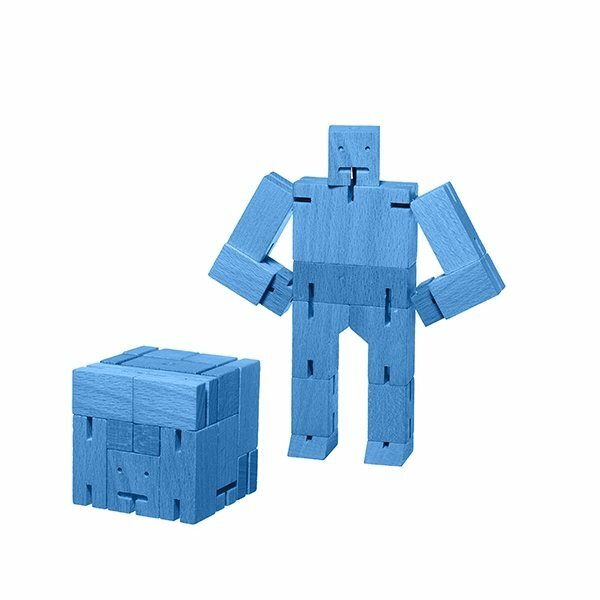 Inspired by Japanese Shinto Kumi-ki puzzles, the Cubebot is a non-traditional take on the toy robot. Cubebots' powerful hardwood (beech wood) frame can hold dozens of poses, and his elastic-band muscles and durable wood limbs make him impervious to breakage. When it's time for him to rest, he folds into a perfect cube. 6 3/4" H, 9 1/4" arm span (at play); 2 1/2" x 2 1/2"cube (at rest). We had people coming from other departments asking if we had any extras. Ease of process and timeliness. the product delivered as promised.